In the end of 1933 the Daimler-Benz factories designed and started production of a light command tank (Panzerbefehlswagen Klein) for command and control of large tank units. It was developed on the basis of the light machine-gun tank Pz.Kpfw. I in 1935-1941. They manufactured 200 light tanks, including 6 vehicles on the basis of the Pz.Kpfw. ausf. A and 194 on the basis of the Pz.Kpfw. I ausf. B. The new vehicle weighed 5.9 tons, carried one MG-13 and one MG-14 machine gun and was handled by a three man crew. Additionally, the tank was equipped with powerful FU-5 or FU-6 transcievers. It’s top speed reached 40 kph, while the range was 170 km. The light command tanks were introduced into the headquarters companies of armored regiments and tank battalions – 4 vehicles each. Two or three machines were sold to Spain and were operational within the Francoist 1st and 2nd tank battalions during the civil war in 1936-1939. On September 1, 1939, 184 light command tanks crossed the Polish border. Five of them were destroyed in fighting. Some hundred tanks of this type fought in action in France in the summer of 1940 in ten armored divisions, and suffered more severe losses – up to 40 vehicles were destroyed. Right before the aggression against the Soviet Union in June of 1941, Germany had 141 light armored command tanks. Several vehicles of this type were operational within two armored divisions of the German Afrika Korps in Libya. These tanks suffered great losses in the Soviet Union and North Africa and in 1942 their production was stopped. Before 1940, light command tanks like other armored vehicles had camouflage paint. The dark-grey spots covered two-thirds of the surface while the rest was covered with dark-brown spots. Since 1940, all armor in the Wehrmacht was painted dartk-grey. For Africa in 1941, the base color was yellow-brown camouflaged with dark-green irregular spots and stripes. In Russia in winter 1941, tanks were camouflaged with whitewash and other available materials. In 1936 German tanks carried a white “Balkenkreuze” cross on the sides and on the turret as a national symbol, which was replaced in 1940 with the Teutonic cross – a black one with a thin white border. The front and the rear wore yellow insignia of divisions and regiments. The tanks that in 1940-1941 were operational within the tank groups under command of F. Kleist and H.W. Guderian were marked with white letters K and G on the hull or the mudguards. The command tanks tactical letters and numbers positioned on the cabin sides were white and later on were black and red with white border. The regiment headquarters designation was letter R, while battalion headquarters had Roman numerals I, II or III (the latter was true in 1941 for in the 3rd, 6th, 7th, 8th, 12th, 17th, 18th, 19th and 20th armored divisions). Then came two figures 01 for the regiment or battalion commander, 02 for the commander’s aid, 03 for the executive officer, 04 for the signal officer. Zvezda is a model company based in Moscow, Russia. This kit is a re-pop of a Italeri kit. This kit came in a shrink-wrapped end opening type box. I am no fan of this type of box as parts, PE frets or decal sheets invariably find their way past the end flaps to become lost. Give me a tray and lid type box any day. 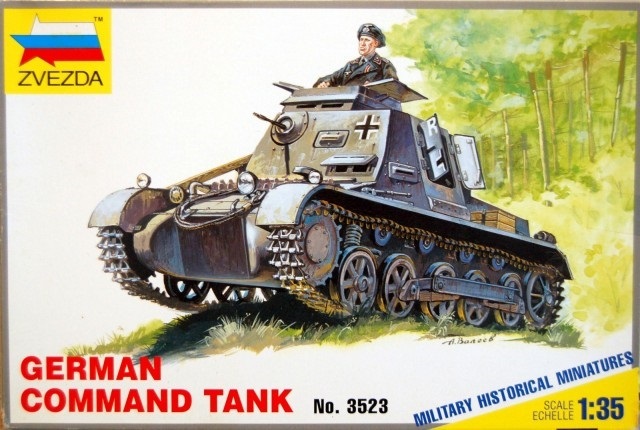 The box art shows a Pz.Kpfw. Ausf. B command tank in a grassy clearing in a woods. It is in overall panzer grey with a black cross outlined in white on the right front of the fighting compartment. A white letter R is on the front door of the two entry doors in the side of the fighting compartment. These doors are shown open. A crewman in black uniform and wearing a beret hat is standing in the top hatch. 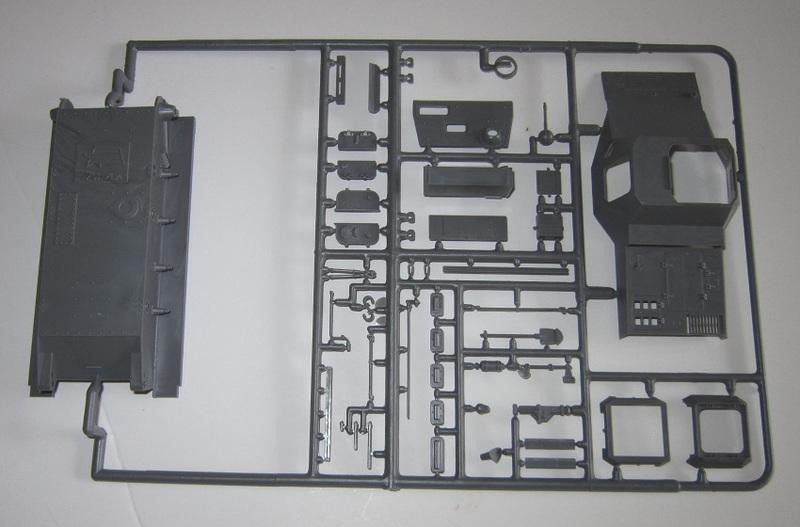 The other side panel begins by saying that the kit is for modelers over 10 in 4 languages, including English. The kit was made in Russia and Zvezda’s address in Moscow is provided. The kit was packed in Italy by Italeri and their street address is also given there. The kit is not suitable for children under 3 due to small parts is said in multiple languages. The copyright date is 1996. This is all followed by a second smaller color illustration of the box art. I’m pretty positive that all of these kits are ex-Italeri molds. This kit contains 2 dark grey trees of part, a tree of black vinyl rubber band type treads, the decal sheet and instructions. There are no clear parts included. The instructions consist of a single sheet that accordion folds out into 6 pages in 6 ½” x 9 ¾” page format. Page 1 of the instructions begins with black and white photo of the model made up without any markings. This is followed by the history of the tank in English. Page 2 is the parts trees illustrations. Page 3 to 4 have a grand total of 6 assembly steps. Step 6 shows you to heat weld the vinyl tracks into a loop. They are not the newer glueable type. Page 5 begins by saying that the manufacturer of the kit is Zvezda and gives their address in Russia. Below that it says that Italeri is the seller and gives their address in Italy. The bottom of the page has a profile like drawing of the command tank with R01 on the entry doors to the fighting compartment and decal application instructions. A black and white photo of a rear view of the model made up appears and painting instructions for the standing figure in the kit and how to add his pipe and pistol holster. The rest of him is molded in one piece. Page 6 begins with 5 illustrations of how to use hobby tools, followed by two 3-view for marking schemes. One shows a small white skeletal national cross at the bottom of the crew entry doors on the sides of the fighting compartment, a white division logo of a figure holding a sword on the sides, front and rear of the tank. No division is mentioned. Bad move Zvezda. The other 3-view shows a tank with black crosses on the front and rear. Unfortunately only white skeletal crosses are on the decal sheet. Another bad move Zvezda? A yellow division logo of a circle divided into 4ths is on the front and rear. Again, no mention of what division this is. 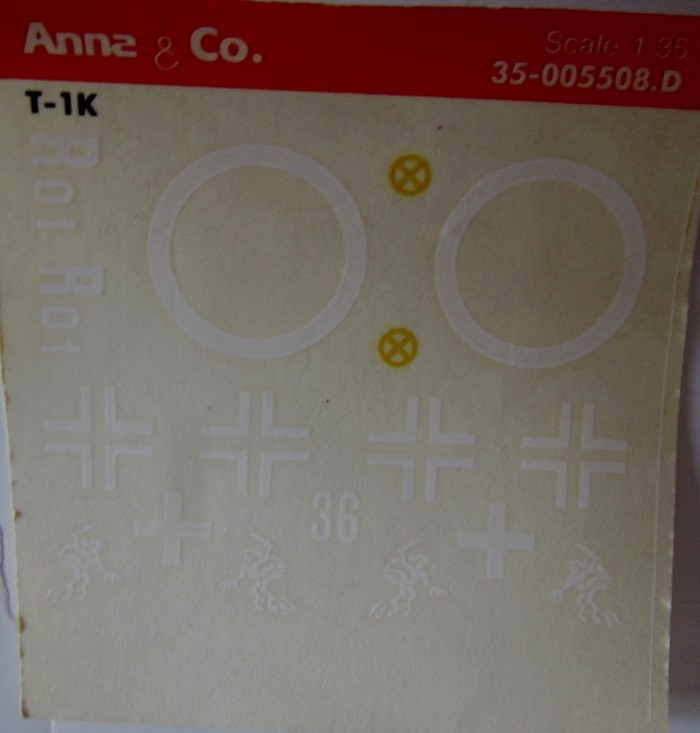 There are 2 large white circles on the decal sheet, but no mention of them in the instructions. Zvezda kind of dropped the ball on giving information of marks on the decal. Below these two drawings is 5 general assembly instructions. Trees are not alphabetized. Instead they are designated with geometric symbols on the parts trees drawings. One tree is marked with a square. The next tee is marked with triangle and the treads with a circle. Triangle dark grey tree holds: the bogies, the standing figure, road wheels, drive sprockets, return rollers, idler wheels, hull nose plate, muffler, coiled tow cable etc. (121 parts) 10 parts are excess and not needed to complete the model. The decal sheet completes the kits contents. It is printed all in white except for the 2 yellow division logos. This white against white is impossible to photograph and have anything appear afterwards. So, I’ll beg off and just describe it. This kit is an original Italeri mold that first appeared in the 1970’s under the Italeri banner as kit no. 207. During that same time it again was re-released as a Revell/Italeri brand kit no. H-2200. Italeri again re-released it in 1980 with the same 207 kit no. The last re-release of it was in 1981 under the TOMY brand as kit no. 25. Looks like Italeri farmed out the molds for this subject and other AFV kits too. Nice kit. But I would have liked a crew figure to go in the tank, instead of the dude in the great coat that is supposed to be posed standing beside the tank smoking his pipe. The model has no interior to see, so you might as well glue the separate entry doors shut.